In our text this morning we hear about various great leaders. The story of Gideon, who becomes the mighty warrior. Our second lesson is from Paul who makes a profound impact upon the church. In the gospel reading we see Jesus calling the disciples who will one day shepherd the emerging church. You could read all these texts about God raising up leaders, but in another sense you might read these texts as him raising up followers. Eugene Peterson once led a conference on leadership and in the opening session he said, “we have lots of conferences on leadership. Maybe we need more conferences on followership.” He proceeded to talk about what it means to be a follower of Christ. In one sense, Christ inverts the whole idea of what a leader looks like, what authority looks like. This morning, I’d like to briefly meditate upon how various people lead or inspire at various points as led by the Spirit. There’s only one head, it’s Christ himself and then various people move in different ways at different times. So we might think of the ministry of the church and leadership within the church through the lens of like a jazz ensemble. Now I’m not a musician but when I listen to jazz music this is sort of what came to mind so I might even use the wrong language for those who are music people. One instrument introduces a line of music. A jazz standard. It’s like a phrase of language that musician communicates through his instrument. Gradually other instruments join in repeating the initial musical phrase. Then various musicians take turns exploring this phrase through the unique sound their instruments make. As each player plays, she draws upon her musical vocabulary to repeat the phrase through chord progressions and rhythmic alterations. The specific line of music provides a framework for improvisation as musicians interact and communicate through their various instruments. They are speaking a language. They are translating a phrase of music. They are listening and responding to one another, harmonizing around the basic tune. 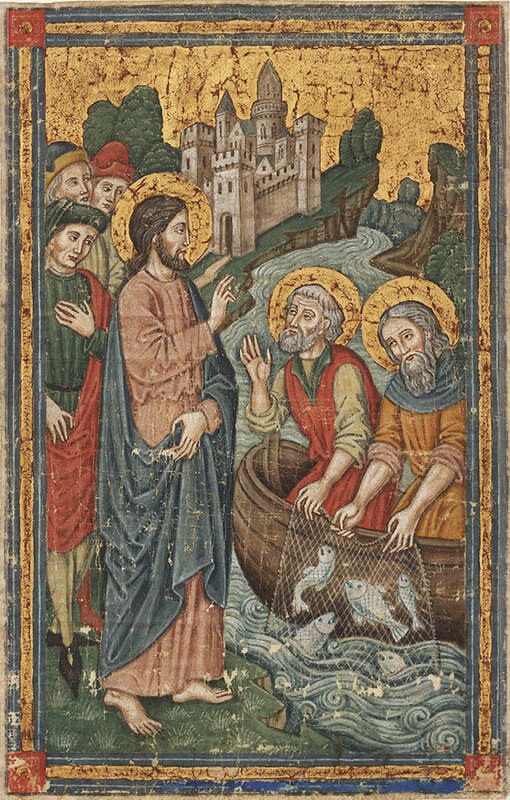 Jesus calls Peter, James, John and other disciples. Each of these men and eventually women hear the Word of love, the Word of God in and through the person of Jesus. He is the perfect icon or image of the Father. He is teaching in word and deed the very life of God, the very life of the Father, Son and Spirit. He even speaks of this relation of dependence and loving obedience. Before Jesus, they had a particular view of leadership and particular expectations of the Messiah, but he is revealing this truth in fullness. He comes in humility not in military power. He fulfills the law while challenging the understanding of the law. He is revealing the very wisdom of God in fullness. As the church has understood it, this fullness incudes the entire life of Jesus, from birth to death, from the cross to the resurrection and even to the ascension. In Jesus, the disciples are beholding the very shape of God’s love. They will bear witness to this same life and love in word and deed. Though they will misunderstand at times, Jesus will clarify, correct, and His Spirit lead them into all truth. They are formed as Witnesses of the Good News. This Gospel will resonate through each disciples in particular ways. Yet each will bear witness to the same Good News. As we read the Acts of the Apostles, we see Peter take the forefront at times. James take the forefront at times. We see young disciples who most likely grew up in the community of faith take the forefront. Disciples like Stephen and Philip. Later a disciple appears that was not part of this community. Paul was an enemy of this community. But something has happened to him. He begins to bear witness to the same Good News. He will even bring his ministry and proclamation before the leaders in Jerusalem. To make sure that he and they are in one accord. There is a mutuality of leadership under Christ. This same witness of love has been handed down across the ages. When we speak of tradition, we are speaking of the faithful handing down of this Good News from one generation to another. This is pretty amazing since it has been handed down in sorts of difficult situations over the past two thousand years. The early disciples wrote down this Good News and we study their writings, but this has also been handed down in person in word and deed. We hear the Good News in and through people, through personal relations. In Acts 9, when Paul has an encounter with Jesus on the road to Damascus, he is told to go into the city where he will be told what to do (Acts 9). Though he has the dramatic encounter with the Lord Jesus on the road to Damascus, he must still hear the word of grace and healing through another person, through Ananias. In Acts 10, the Gentile Cornelius has an encounter with the angel of the Lord. Once again, he must hear the word of grace and healing through another person. He is instructed to send for Peter. Simultaneously, Peter is being instructed through a vision to bring the Good News to a Gentile. Or in the eyes of a Jew, an unclean person. Across the ages, the Spirit of God has worked in and through people to bring the Good News of redeeming grace in Jesus Christ. Mothers and father have prayed and shared the faith with their children. Colleagues have shared the faith with their co-workers. Some have been inspired to take the word of grace to their enemies like the Anglo-Saxons who shared the faith with their Viking invaders. There is a pattern in this witness. We encounter the word of God in Christ in childhood, as young adults, as married couples, as aging believers. We are shaped in Christ by the Word and Sacrament in the midst of people, in a family, a community of friends. Even as we are shaped by God’s Spirit this His gifts of grace and His people, we are also shaping others and sharing the Good News with others. Let’s return to the jazz example. Think about a musician playing a line of melody. The person who wants to join the jazz ensemble must first learn how to play an instrument. Then how to read music. How to play a song. There is some form of catechism, of learning the craft. This happens in a community of musicians. Each week we are learning afresh to translate the Gospel through our own lives. We gather and rehearse the lessons of Scripture; we hear the Good News; we proclaim the love of God made known in Father, Son, and Holy Spirit. In the words of St. Irenaeus, we rehearse the faith that has been handed down publicly. We hear it. We sing it. We pray it. We even eat it in His Body Broken for Us and His Blood Shed for us. Then we are sent out as translators of the Good News. Just as the jazz musicians sounds a particular sound through his or her instrument, we are living instruments of the song of salvation. When St. Paul proclaims the Gospel, he shares as one who was trained as an expert in Torah, so in one sense Paul is reinterpreting Torah in light of Christ. When St. Augustine shares the Gospel, he translates the Gospel into his metropolitan world and speaks about a City of God. St. Patrick shares the Gospel in rural, pastoral settings so unlike the metropolitan world of St. Augustine. Instead of speaking about a city of God, St. Patrick and the Celts after him share the Gospel using the beauty of the created world that surrounds them. John Calvin shares the Gospel as one who was trained as a lawyer. Whereas St. Ignatius shares the Gospel as a former soldier. And St. Francis shares the Gospel as a troubadour, a singer of love songs. We are learning an ancient song of joy that resounds across the ages. According to Job at the foundation of the earth, “the morning stars sang together and all the sons of God shouted for joy” (Job 38:7). That same song resonates in our very bones, and in Christ Jesus we’ve been restored to the song of joy and hope and expectation in the great goodness of God. As we enter into this world with the grace of God in our lives and the word of His love on our lips, we discover that not everyone can hear the song. There is another song resounding in the culture. A lament of despair. For many people suffer and grieve at the pain in this world. Some sing a song of blame; others sing a song of bitterness. Anger, pain, frustration resounds in news, through our social media, and even in the families. We don’t take lightly the pain and suffering in our world. Scripture tells this story of grief and anger and blaming. We see Cain blaming Abel because God rejected his offering. This blame becomes murder. We see this violence spread in cultures and people. Scripture is filled with stories of grief and pain, loss and bitterness, sorrow and sadness. The book of Psalms, our book of songs gives voice to worship through all the varied experiences of human life: temptation, oppression, fear, anger, loss, shame, depression, as well as hope, vision, and longing for the fulfillment of God’s promises. By the time we reach the final Psalm all creation has burst in an echoing shout of joy before the Lord. The scripture is training us to turn every bit of pain and sorrow back to God in prayer and worship. As we meditate on these ancient stories in Scripture in light of Christ and the Spirit, it would be hopeful that we could begin to see how he’s weaving us into this story. That he is training us to be singers of this song of praise. How the good news is resounding through us whether we’re in joy or sorrow. We ourselves become the very song of God. When we go out as his people bearing good news and by the training and by his Spirit we learn how to grieve when people are grieving. How to laugh when people are laughing, how to serve those in need. That all we encounter, somehow we might become witnesses of his good news as by his spirit he’s carrying on this tradition of faith and hope in Christ, and the image of Scripture once again. Bringing all things into Christ, that Christ might be all in all.